Today a new book by Peter Maass was released. The book is called Crude World: The Violent Twilight of Oil. Peter Maass is a name you may know from a 2005 article that he wrote for the New York Times called The Breaking Point. The story was a comprehensive look at where he thought oil production/prices were headed – and what the implications might be. Maass focused on Saudi Arabia in the article, and spent a lot of time covering Matt Simmons’ viewpoints. It was after reading this story that New York Times columnist John Tierney offered to bet Simmons on the future direction of oil prices. Thus arose the Simmons-Tierney bet. I thought Maass’ 2005 article was well-researched, and it was a captivating read. So when Mr. Maass e-mailed and asked if I would like a copy of his new book, I thought it would probably be a book I would enjoy. I still have a stack of books that have been sent to me to review, but I jumped this one to the front of the queue. I hadn’t really intended to, as I am working on two other books right now*, and would normally finish those before starting another. But once I picked this book up and started thumbing through it, I couldn’t put it down. The subtitle of the book is The Violent Twilight of Oil. The book talks about the twilight of oil, but as the chapter titles imply the focus is less on the twilight and more on the seedy side of the business. The book notes that there are some countries like Norway, Canada, United Arab Emirates, Kuwait and Brunei to which oil appears to have generally benefited the population as a whole. But then there are also many cases in which the discovery of oil seems to have brought many problems to the population. (The book suggests that countries with established democracies and strong self identities are less likely to suffer following the discovery of oil). The chapters read like the Seven Deadly Sins: “Plunder”, “Rot”, “Fear”, “Greed”, and “Desire” are a few of the ‘sins’ covered in various chapters. Within each chapter, Maass then takes a look at an example that embodies that particular “sin.” That sort of style reminded me of a really good book I read a few years ago written by Matt Ridley. It was called Genome: The Autobiography of a Species in 23 Chapters. Each chapter of that book tells the tale of one gene from each chromosome. 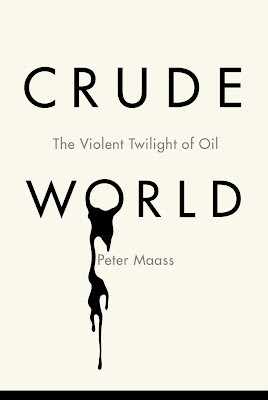 In Crude World, Peter Maass tells the story of oil one dysfunctional example at a time. The book picked up where the New York Times story left off. In fact, Chapter 1 – Scarcity – was mostly about Saudi Arabia and incorporates much of that 2005 story. And if you liked his New York Times story, you will probably enjoy the book as the same style is evident. But I use the word “enjoy” loosely, as it is a sober read. You will find yourself shaking your head at some of the things that have been carried out as a result of the world’s desire for oil. In Chapter 2 – Plunder – the book covers the case of Equatorial Guinea. The oil wealth was plundered, with the help of international oil companies, banks that looked the other way as government officials brought suitcases of money in for deposit, and governments eager for access to the resource. While he was investigating the oil story in Equatorial Guinea, Maass was accused of being a spy and kicked out of the country. Chapter 3 – Rot – was all about Nigeria. I won’t tell you how that one turns out, but I am amazed at the (dangerous) lengths Maass went to for the story. Rot describes his journey deep into the Niger Delta in a leaky canoe, courtesy of one of the local warlords. It is well known in the oil industry that Nigeria is a dangerous place to operate. Oil companies generally pay very big premiums to get workers to agree to an assignment in Nigeria. Oil workers are kidnapped in Nigeria regularly (but rarely harmed) and held for ransom from the oil companies operating there. Warlords are constantly doing battle there, and Maass described his visit to one village that had been attacked. Shell also featured prominently in this chapter. Chapter 4 – Contamination – tells the story of Ecuador, with special focus on the Chevron lawsuit. Maass notes the irony that California – one of the most environmentally conscious states – receives the largest portion of Ecuador’s exports. The rest of the book’s ten chapters covers a litany of oil-induced miseries. Iraq, Russia, and Venezuela are all profiled. Former ExxonMobil CEO Lee Raymond is presented as the face of “Greed” (albeit it in the “Fear” chapter). There is an interesting explanation in “Greed” on why companies function as they do. Maass discusses a court case between Henry Ford and the Dodge brothers, in which the court ruled that a company’s mission “is organized and carried on primarily for the profit of its shareholders.” Thus, Maass argues that if Mr. Raymond had decided to run ExxonMobil in a more altruistic manner, the board would have removed him for not operating in the best interests of the shareholders. The complaint that some will have about the book is that it isn’t balanced. There are a number of villains portrayed, but the oil companies really stand out. It seems that those who are telling the tales of misdeeds are generally trusted in the book, but those who are interviewed for balance are treated with suspicion. For instance, in the chapter on Nigeria, the author interviewed the director of Shell’s operations in Nigeria. The interview appears to proceed like a cross-examination. A Nigerian warlord’s words, on the other hand, seem to be taken mostly at face value. But this is not intended to be a balanced book. It is a book designed to highlight the downside of our oil dependence. We can all think about ways in which oil has made our life better, but in the Western world we are generally spared from the nasty side of the business. In this book, Maass brings that message home loud and clear. Crude World was released today, September 22, 2009. The general theme of the book is that the world’s dependence on oil has come at a very high price. This is not a book on peak oil, climate change, or renewable energy. It is not a technical book on the oil industry (for that see Morgan Downey’s Oil 101 ). The book covers the misery – the wars, the corruption, and the ruined lives – brought about primarily by greed from the lure of black gold. The book highlights the irony that oil could be used to improve the lives of a country’s citizens, but in far too many cases a country’s citizens end up being worse off after oil is discovered. The book was a fascinating read, and I couldn’t put it down once I started it. Now I can get back to my regularly scheduled reading. * The other books I am working on right now are Axis by Robert Charles Wilson and Outsourcing Energy Management by Steven Fawkes. The former is a science fiction book that I picked up because I really enjoyed Wilson’s previous book Spin. The latter has been a difficult read; I have been working on the book for six months. I met the author earlier in the year when he visited the Titan Wood plant in the Netherlands. We had quite a lot in common, and he sent me a copy of his book. But it is really a textbook, and so I have been reading it in small doses.